A glance at photographs of Doha in the 1950s and 1960s, compared with today, is sufficient to understand how much this part of the world has changed. From a little village, it has become a capital. What could be more natural, then, than the desire to testify, to talk about identification, about the evolving identity of this country as it reveals itself on the sensitive paper of history? 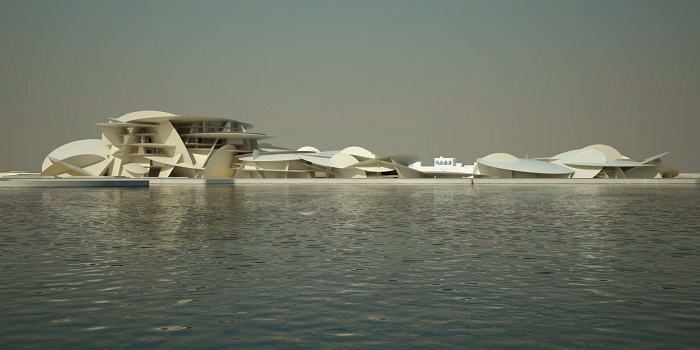 And what could be more logical than to give concrete expression to this identification process in a National Museum of Qatar that will relate the physical, human and economic geography of the country, together with its history? Most importantly, though, it will spark an awareness that could only otherwise be encountered, experienced, after months spent in the desert, in pursuit of the particularities that elude our grasp except when the whims of Time and Nature allow. Or by taking an helicopter or 4WD to discover the contrasts and stretches of beach of the Qatari peninsula. Everything in this museum works to make the visitor feel the desert and the sea. 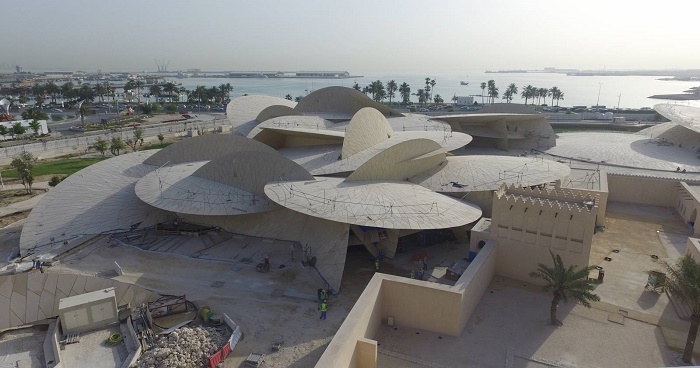 The museum’s architecture and structure symbolize the mysteries of the desert’s concretions and crystallizations, suggesting the interlocking pattern of the bladelike petals of the desert rose. A nomadic people builds its capital city and talks about it through this emblematic monument built with the most contemporary construction tools (steel, glass and fiber concrete), and will communicate through high-definition cinema, incorporating visitors’ movements into its museography : this museum is a modern-day caravanserai. From there you leave for the desert and you return from it bringing back treasures: images that remain forever engraved on your memory.